This article first appeared in the Wells Journal on Thursday 23 January 2014. One day I would like to own my own pig; one day when I’m all grown up and have a vast enough garden, so I can fence off an entire section for the pig to churn up. Oh, and a house big enough to accommodate a huge chest freezer too. I like the idea of keeping a pig for home-reared pork and bacon. I’d love to learn about butchery and making my own ham and sausages, as well as having a go at things like chorizo or salami. It’s a bit of a romantic ‘good life’ idea, I know, but the pig is an incredible beast when it comes to providing meat. I don’t think there’s any part of the animal you can’t eat; nothing gets thrown away. How’s that for good value? For now I must rely on my local butcher as my source of free range pork, and I enjoy exploring and cooking with different parts of the animal. I have yet to try the trotter but I am extremely partial to pig cheek, which is cheap as chips. The first time I asked my butcher for cheek, a few years back, I came home with a couple of sections of pig head, complete with parts of an ear and snout. Thank goodness I’m not a particularly sensitive type, as it took quite a lot of hacking to extract the cheek. I’ve now learned to ask the butcher to trim it down for me. Ham hock or knuckle is another cheap cut. It has a wonderful flavour and a little goes a long way. Plus when the hock is cooked, you’re left with a delicious stock which makes the perfect base for a soup. Ham hock terrine is one of our favourite dishes. Whenever we have family gatherings where we are asked to contribute one of the courses, this terrine is what we normally turn up with. 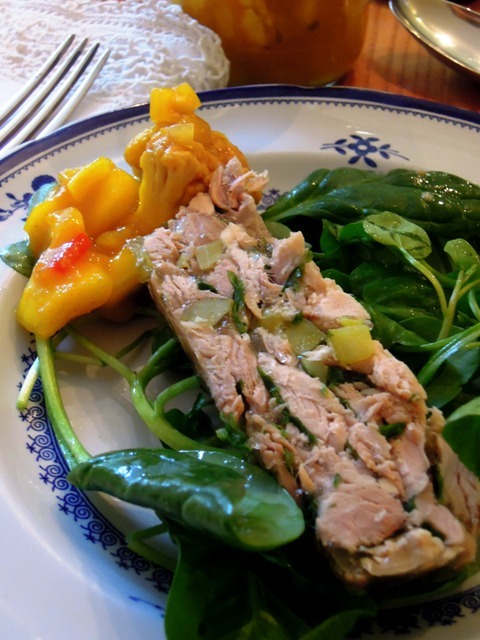 It’s a lovely starter served with homemade piccalilli (I followed Mark Hix’s simple recipe, which is very good) and a few leaves, or try it with crusty bread for a delicious light lunch. Place the ham hock into a large pan, with the carrots, celery, onion and peppercorns. Cover with cold water and bring to the boil. Cover, reduce the heat, and simmer for 3 hours until tender. Take the ham out of the pan and set aside. Leave the stock to cool. Wet the inside of a 900g loaf tin and carefully line with three layers of cling film. Make sure you leave excess cling film overhanging. When the ham is cold, pull the meat off the bone and tear into strips into a large bowl. Discard the fat. Add the parsley and cornichons to the ham and combine. Spoon the mixture into the lined tin. Soak the gelatine in a bowl of cold water for 5 minutes. Pour 300ml of the stock into a saucepan, warm through and remove from the heat. Remove the gelatine from the water, squeeze out the water and place in the cooking stock. Gently stir until melted and leave to cool. Carefully pour the gelatine and stock into the tin. Wrap the overhanging cling film over to seal the terrine. Cut some card large to just cover the terrine and wrap in foil. Place on top of the sealed terrine, and wrap the whole thing in more cling film. Set overnight in the fridge. 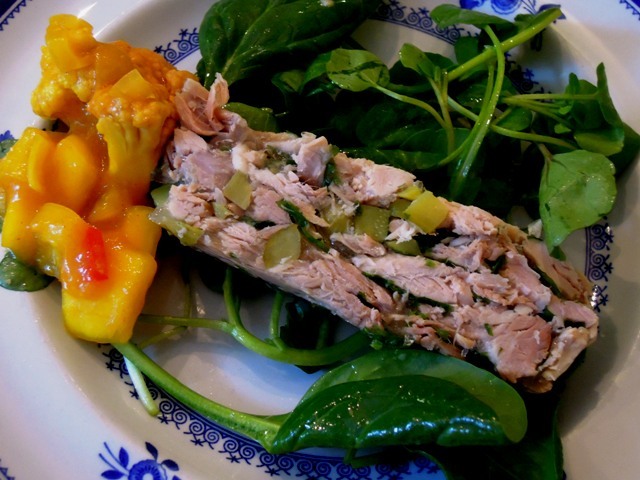 Use a sharp knife to cut the terrine into thick slices and serve with a simple rocket and spinach salad and a generous dollop of piccalilli. Have you read ‘Goose Fat and Garlic’ by Jeanne Strang? After reading about your passion for the pig I thought it sounded right up your street. I am very excited to have connected with a Dutch blogger, who has given me a source to find Pig’s head. I’m already planning guanciale, braun and (most exciting of all) Bath chaps. Having seen this, I am going to ask him to save me a hock or two, too.